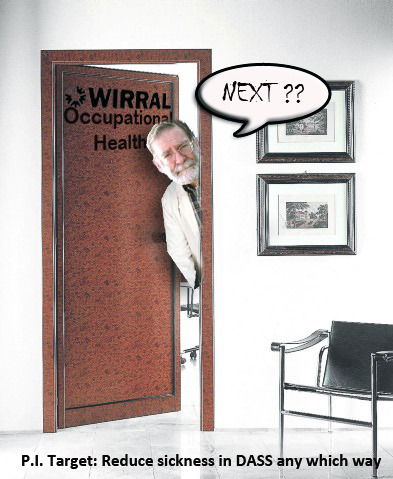 More news of Wirral Councils excellence in providing a bespoke support service to sick employees reaches us. We have been contacted by a number of employees who have told us that referrals they themselves had requested to Occupational Health, after feeling unable to cope, have been deliberately delayed. We would ask what medical expertise such jumped up, unquestioning, blithely, acquiescent town hall clerks have when deciding what is or isn’t an “appropriate referral.” Yet again WBC seems to have more unofficial policies (such as the 4 week delay) to save money and manipulate statistics whilst putting people’s health at risk. We have been contacted by another former employee in DASS who tells us one manager wanted all sickness records for his entire team “wiping” so everybody could start with a clean slate. This was overruled by HR, but again shows the mindset in DASS is one of spin and deception. We wonder what an industrial tribunal would make of such practices. This is what WBC Council leader sent to staff this Christmas… beyond parody really, and you have to ask the the question , what the hell have they been doing the last ten years ??????? Hi everyone! I know it’s getting close to Christmas and we’ve all got our minds on other things, but I did promise that I would be back to talk to you in more detail about changes that are happening in the Council, so this is the latest update. On Monday night the Council agreed to send the Council’s revised Corporate Plan to Scrutiny Committees for debate. I want all of you to be involved as well because this is about making a real difference together to the place where we live and work but we need to sign up to making it happen, and I need to know you’re all on board with me. Money is in short supply. There are fewer of us to meet the ever growing demands for services and sometimes it feels as if we’re just running to stand still. It’s important not to feel totally overwhelmed, so we need to have a very clear idea of where we are going, how we are going to get there and why that journey matters. And we need to understand how each one of us fits into the bigger picture. The Corporate Plan sets out our destination, in a clear Vision for Wirral. It maps out how we are going to get there. It looks at ways in which we can travel safely (and cost effectively), it lays down the values that we all share, and then it sets out in more detail what that means in practice for all of us. The foreword I’ve written to the Corporate Plan explains this. You can find the Corporate Plan on the Council website. I would very much like you to find time to read it if you can. (It isn’t very long). One of the things I really want you to understand, because it took me some time to get my head round this, is this phrase “Corporate Governance” which you’ll keep hearing because Wirral is undergoing a “Corporate Governance Review” at the moment. Frankly, it sounds pretty bureaucratic and boring and “nothing to do with us” as we struggle to meet the daily demands of our job. But it isn’t. To me it’s like going back to the basics of learning to drive again. 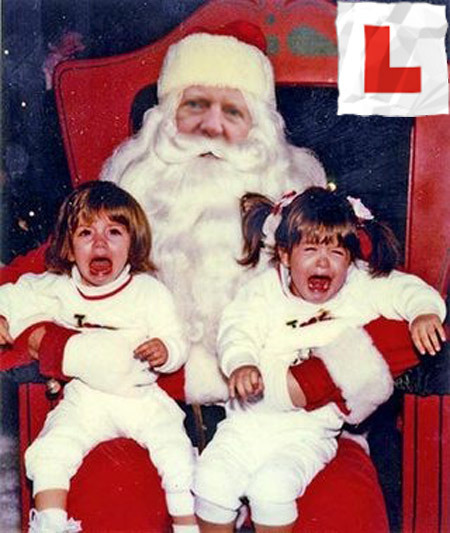 Remember studying the Highway Code? Learning how to change gears? Remember that moment when you thought you would never get the hang of it and that there were just too many things to think about all at once, and now, when you drive, you don’t think about it all and it all just happens automatically? Well, that’s what we’re aiming for – doing the right thing automatically all the time so we can get to where we want to go without any disasters, without unnecessary stress, and without paying more than we need to because we have made avoidable mistakes. So here’s what we’ve decided to do to make sure we’re all working together. § We will have a couple of big “Meet the Staff” events where my deputy Phil Davies and I will be sharing with you what the Vision is and what we need to do together to achieve it. § We will be setting up a number of smaller focus groups in different areas where there’s space to discuss where we are going and hear what you have to say about it. § We will be contacting you individually with a short questionnaire to give you the opportunity to tell us what you think about the Council now, and where you think we should be going. § We will be setting up a confidential e-mail line where you can contact us with any fears you may have, or details of anything you think might be getting in the way of achieving our Vision, or behaviour which contradicts the values we are signing up to together. § We will be setting up special meetings with Cabinet members, so you can make an individual appointment to talk directly, in confidence, to the appropriate Cabinet member and raise anything that may be bothering you. Basically, we’re doing two things. The first is to make sure we all know and agree where we are going and understand the way there and how to get there safely. The second is to make sure we dynamite any obstacles out of the way so we have a real, fighting chance of making a difference to Wirral we can all be proud of. Just think, if we could really create a healthy and prosperous society, where people feel good and where the place you live and the amount you earn no longer effects how long you live, wouldn’t that be something? If we could wipe out the stark possibility that exists now of dying ten years earlier if you’re poor than someone who lives in a wealthy part of the borough? Now that is something worth working for, something worth changing for. It doesn’t have to be just a dream. Well done Wirral Globe for continuing in their support for whistleblower and campaigner for the rights of vulnerable residents in the care of the council,Martin Morton. Her worship-fulness, the mayor of the Metropolitan Borough of Wirral and Rock Ferry patron saint of the disabled, and defender of of human rights, Councillor Moira McLaughlin (above) has seen it. 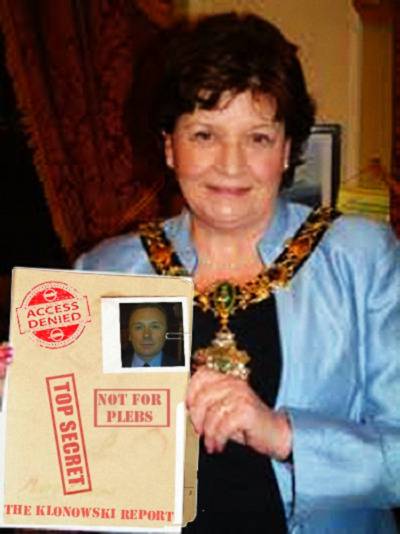 So has our much loved Council leader, the rubicund, puce hued Steve “Foulksey” Foulkes…. but we haven’t and we paid for the bugger!!! For those council tax payers on The Wirral who have been following the Leveson and Mid-Staffordshire inquiries it must seem like they’re living in the past “- a foreign country -they do things differently there” . 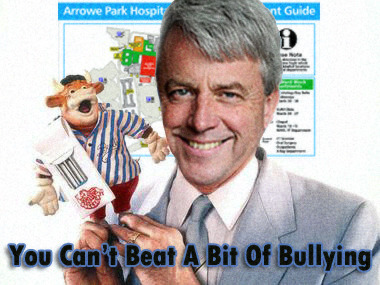 News reports of bullying cultures, gagging clauses,unlawful practices and cover ups seems to be oh so familiar to people on the Wirral.The only difference is that the Leveson/Mid-Staffs inquiries are being conducted in public and powerful individuals are finally being subject to scrutiny and accountability. Meanwhile the Wirral people having forked out £250K for a report into what exactly has been going on in Wirral Council are denied the opportunity to find out what all the fuss is about.Apparently this is because those who have been criticised or face allegations have a “right to reply”. Excuse us but didn’t they have a “right of reply” during the investigation? Lets face it this publicly funded pantomime has been going on long enough! So what exactly is happening now? – Are the not so great and not so good busily comparing notes and consulting lawyers with the intention of watering down the reports findings so that it all becomes “a bit of a kerfuffle”? . I think we should be told !